Detail of Lori's old "Cheddar Cheese and Crackers." The pattern was published in the early 20th century in Comfort magazine as Irish Chain. 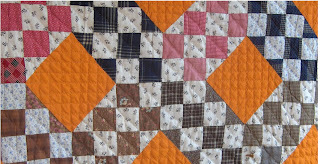 Lori at the blog Humble Quilts drafted a doll quilt, a copy of an antique she called "Cheddar Cheese and Crackers." She invited web friends to make one and then posted a set of links to all the participants' quilts. It's a great reproduction and a clever way to network using a system called MckLinky. I find it interesting that it is an Irish chain but not in the traditional sense of color placement. I think we all had a great time making our little version. In my version of this quilt I used mostly your Civil War Homefront fabrics. I have almost finished piecing the top. Send a photo. I'd love to see it. Click to see a post with quilt shows & seminars. Click on the 1889 pattern to see an online donation form just for this fund. Add your email. Click on the smiling Queen to see our group page. Ask to join. I'll let you in---it's not like being presented at Court. Type a word or two in the box below. GET POSTS IN YOUR EMAIL BOX. Click on Mark's quilt to see the ten pattern links. WHAT IF THE PATTERN PRINTS TOO SMALL? Click on the picture to read the post and the comments. You can fix it. Order STARS IN HER CROWN as printed patterns. I'll mail you the set for $15 in black and white. You still have to copy or trace the templates 3 more times if you want to paper piece but these are perfect for template piecing. Click to see the Etsy shop. Want the whole set of ten patterns NOW? Click to order a PDF to print yourself. New book with over 60 newspaper patterns from 1928 to 1961 and history by me. Click on the cover to see more. Want to use EQ8 & BlockBase on your Mac? Click to see info. on the Migration Kit. The bound volume of this index to 4,000 designs with names is Out of Print & one of Amazon's most requested books. You need it. So 1) Buy an E-Book version directly below. 2) Buy the digital version BlockBase below, which will print any pattern any size. 3) Click on the Amazon button to see what's available used. E-Book version of Encyclopedia of Pieced Quilt Patterns. Click on the book cover to buy a downloadable version. My computer program features over 4,300 patterns. Print rotary cutting or templates: Any size. Pattern ideas, pattern I.D. & pattern drafting. For PC's. Click on the box. I've published a lot of books on quilt history and quilt patterns over the years. Below are links to buy them. First click on the dog to go to my Etsy shop to see if I have any new print copies still in stock that I can autograph & mail them. Patterns & history from my first book on the topic. I still have new copies of the bound books in my Etsy shop. Click to see more. Challenging applique from the heart of quilt country. Full-color, full-sized patterns for classic applique & quilting. Click to see in my Etsy shop. The Encyclopedia of Applique second edition. Click on the bookcover for more information about an eBook or a Print-On-Demand version. Or buy from my stock at my Etsy store above. I'll autograph it. How to date antique fabrics and add to your stash of reproduction prints with projects for reproduction quilts. Buy new Print-on-Demand editions or see what Amazon has below. Get this classic as an eBook. Easy to find index with a digital search. See what Amazon has. CLUES IN THE CALICO: BUY A USED COPY. A guide to making reproduction quilts, choosing reproduction prints and dating fabrics. Traditional blocks to "Unravel the History of Quilts and Slavery." Click here to see print-on-demand & digital editions. Go to Amazon to see more. Sampler Quilt to Recall the Civil War Along the Kansas/Missouri Border. A BOM with 14" traditional blocks and lots of history. Masterpiece applique from Rose Kretsinger, Ilyse Moore and me. Create your own floral medallion with easy to use patterns & instructions. Block of the month: Original applique patterns recalling the landscape of the westward migration. Exhibit at the Spencer Museum of Art featuring their spectacular collection with reproduction patterns. Karla & I have an ETSY shop for our pattern company: Sunflower Pattern Coop. Click on the picture to look around. Below: A few of the patterns & books we're offering. Some we'll send through the mail; some we sell as PDFs for instant download. Civil War commemorative pattern with an appliqued eagle border. Paper pattern packet through the mail. Patriotic design with eagles and flags, based on an antique with ties to Baltimore. PDF instant download. Appliqued sashing in a traditional Southern version of New York Beauty. Click to see a page I've started for quilts inspired by the past. And post your own traditional quilts here. I'm redrafting several of my BOM patterns to sell in my Etsy Shop. Click on the quilters to see the page. #morrishexathon RCCheryl's quilted and bound. Is she the first to finish? Click to see the Pinterest Page with links to each weekly block. Click to see books and quilts for sale. The books are all print editions from early print runs.